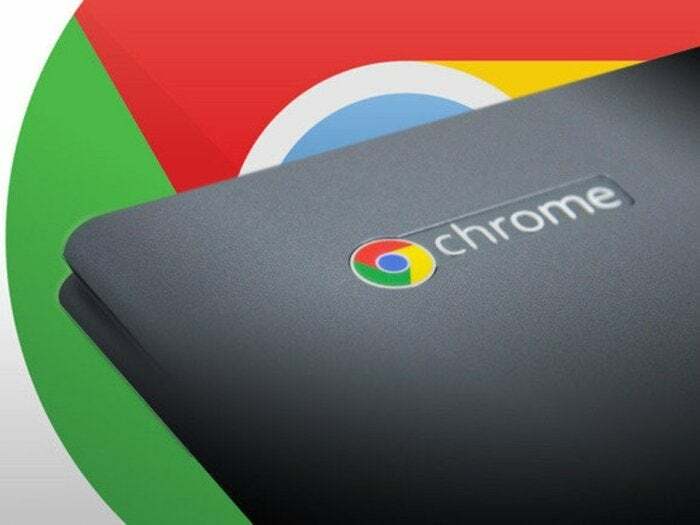 Chromebooks may be all about simplicity, but don't be fooled: Beneath their intuitive outer layer lies a web of advanced options. And you don't have to be a power user to embrace it. Make your way through this massive collection of next-level tips, and you'll be zipping around Chrome OS like a pro in no time. 1. 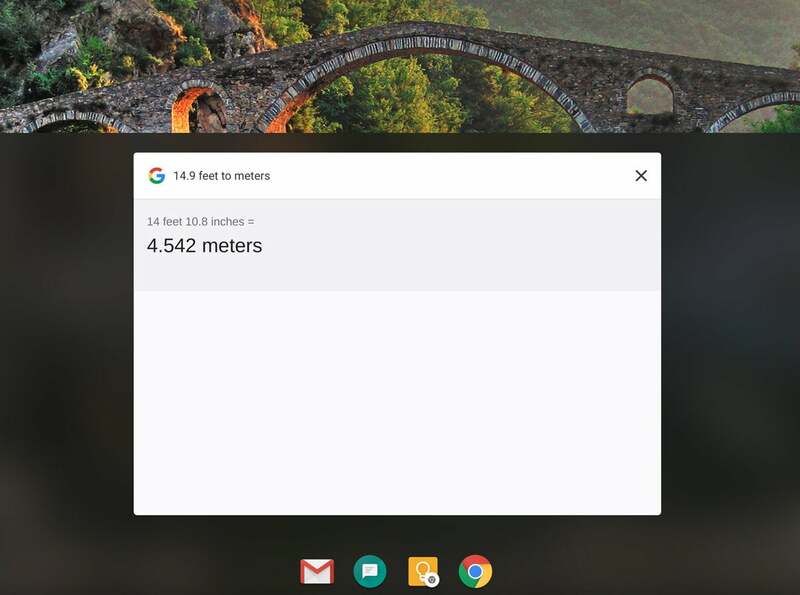 The Chrome OS launcher — the drawer-like interface that appears when you tap the Search key or hit the circle icon in the lower-left corner of the screen — is actually a powerful universal search tool. Just start typing as soon as it appears, and you can find and open apps, pull up websites, and even get answers to specific questions right then and there — no clicking or digging required. 2. The launcher has some easily overlooked extra powers, too. Try typing in calculations ("172.4/3"), for instance, or unit conversions ("14.9 feet to meters") to put Google to work at the system level. 3. If you use an Android phone, keep an eye on the very top part of your Chromebook's launcher. Anytime you've had an article open recently in Chrome on your phone, you'll see that page's title appear as the first suggested item directly beneath the launcher's search bar. Click or tap it to open the article and pick up where you left off. 4. 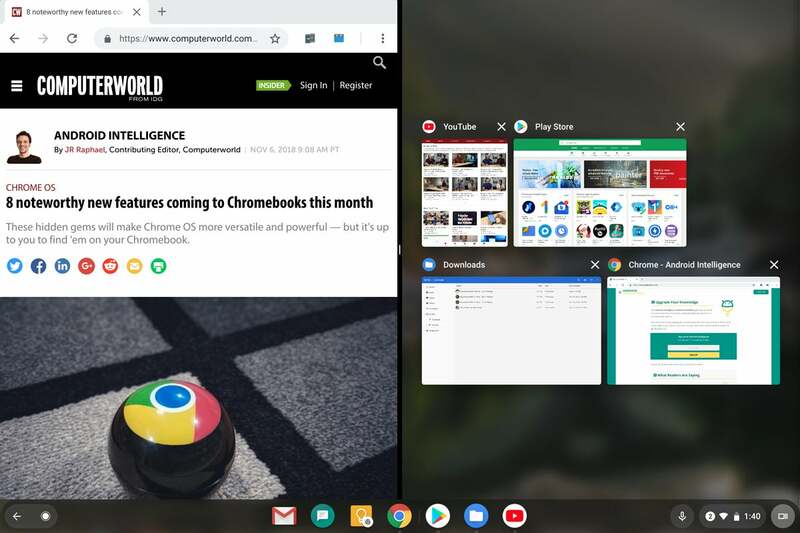 Chrome OS has a hidden gesture for accessing the launcher, which is especially useful when you're using a Chromebook as a tablet: Simply swipe up from an open area at the bottom of the screen, and — just like with Android on Google's Pixel phones — the full launcher will appear. 5. You can hide the shelf — the row of pinned "favorites" at the bottom of your screen — by right-clicking it (clicking with two fingers) or long-pressing on it and then selecting the "Autohide shelf" option that appears. That'll cause the shelf to disappear anytime you have an app or window open and then reappear when you mouse over its area or swipe upward from the bottom of the screen. It'll also always show up when you're viewing your desktop. 6. Quickly open any item on your shelf by pressing Alt and then the number key that corresponds with its position: Alt-1 for the first app in the list, Alt-2 for the second, and so on. 7. Right-click or long-press on any app in your shelf or within the main launcher to reveal a series of program-specific shortcuts. You'll find the most options with Android apps, many of which offer one-touch links to functions like composing new messages, starting new documents, or jumping to specific folders or accounts. 8. 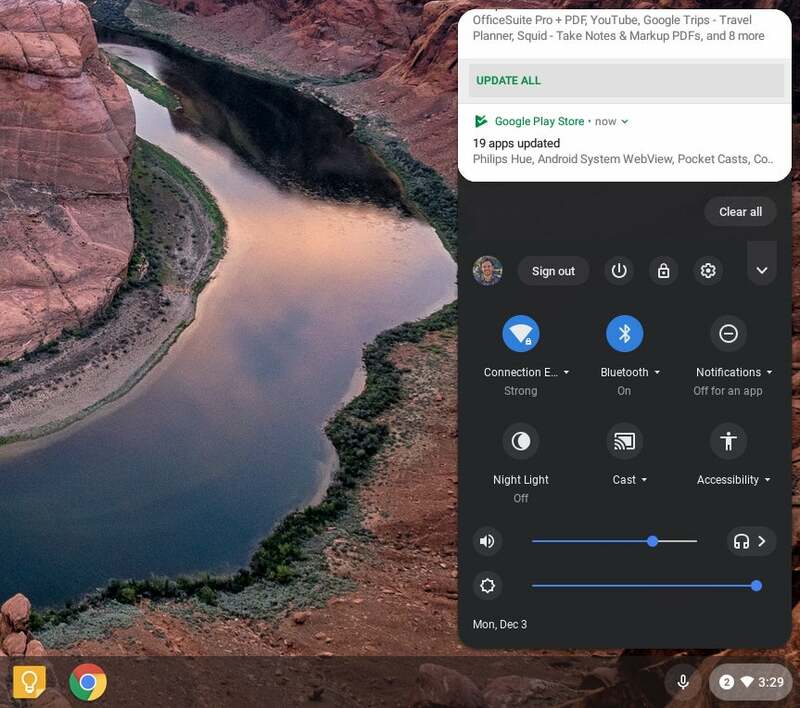 As of 2018, Chrome OS boasts a distinctly Android-like combined Quick Settings and notification panel in its lower-right corner. You can open it without moving your hands off your keyboard by pressing Shift-Alt-N from anywhere in the system. 9. Just like on Android, it's possible to clear out all of your Chrome OS notifications in one fell swoop — but the command is curiously tough to find. Here's the secret: With your notification panel open, scroll up as far as you can on the area of the screen showing notifications. Once you've moved past the bottommost notification, you'll reveal a "Clear all" button. 10. Got a Chromebook with a stylus? You can take notes right from the lock screen with the Google Keep Android app. Install the app and then look in the "Stylus" section of your device's settings to make sure the option for lock-screen note-taking is enabled. Once it's active, you'll see an icon in the upper-right corner of your lock screen that'll let you scribble away. 11. You might not realize it, but your Chromebook has a handy Overview interface for juggling open apps and windows. You can get to it by pressing the button that looks like a box with two lines on your keyboard (in the function row, directly to the left of the brightness controls) or by pressing the similarly shaped icon that appears in the lower-right corner of the screen when a Chromebook is in its tablet mode. 12. Prefer to get around with your trackpad? Make a mental note of this handy hidden trick: You can swipe downward with three fingers on your trackpad from anywhere in the system to open the Overview interface and see all of your open apps. You can then swipe back upward with three fingers to return to your most recently used process. 13. One more nifty Overview access trick: When your convertible Chromebook is in its tablet mode (with the keyboard either detached or swiveled around the back), swipe down from the top of the screen while any app is open. That'll shrink the app down into the Overview screen, where you can drop it and then select any other active app or window you want to open. 14. You can open two apps side by side in a split-screen mode by following the same step described above but then dragging the app to the left or right side of the screen. When you see that half of the screen light up, let go — then either select another active app from the Overview interface or open a new app from your launcher to fill the other half. You can do this with any combination of websites, Chrome apps, Android apps, and even Linux apps (more on those in a moment). 15. 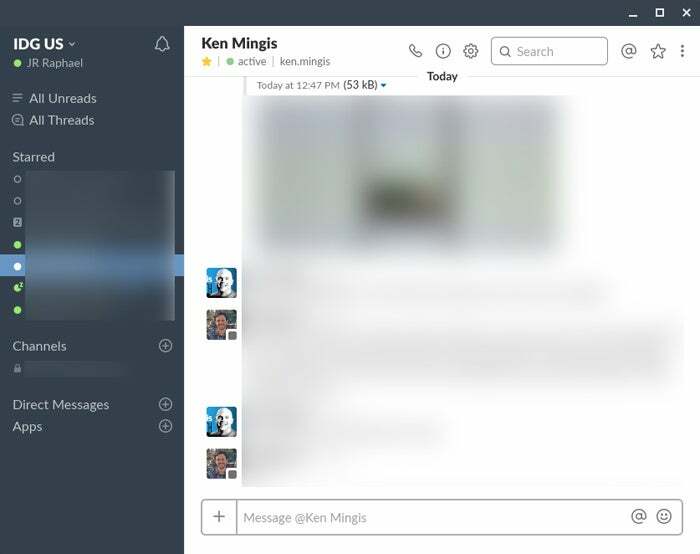 While viewing two apps in a split-screen setup, press and hold the black bar in the center and drag it in either direction to make either side larger or smaller. 16. If you have a lot of apps and windows open, try going into Chrome OS's Overview screen and then typing the name of the process you want. The system will gray out nonmatching items as you type and highlight only those that include whatever letters you've entered. 17. Prefer a faster Alt-Tab-like method of switching between processes? Your Chromebook has that, too — quite literally: Just press Alt-Tab once to toggle back and forth between your two most recently used apps or windows, or press and hold Alt-Tab to pull up a quick switching utility that'll let you tab between all of your actively open items. 18. Want to move backwards in your Alt-Tab list — from right to left instead of left to right? Hold down Shift along with Alt and Tab. 19. Snap any app or window to the side of your screen by hitting either Alt and [ (left bracket) for the left side or Alt and ] (right bracket) for the right side. Repeat the command a second time to return the app or window to its default centered position. 20. Minimize an app or window by pressing Alt and - (the minus key). Press that same key sequence again to bring the app or window back up into its previous position. 21. Maximize an app or window by pressing Alt and = (the equals key). Press that same key sequence again to move the app back into its previous size. 22. 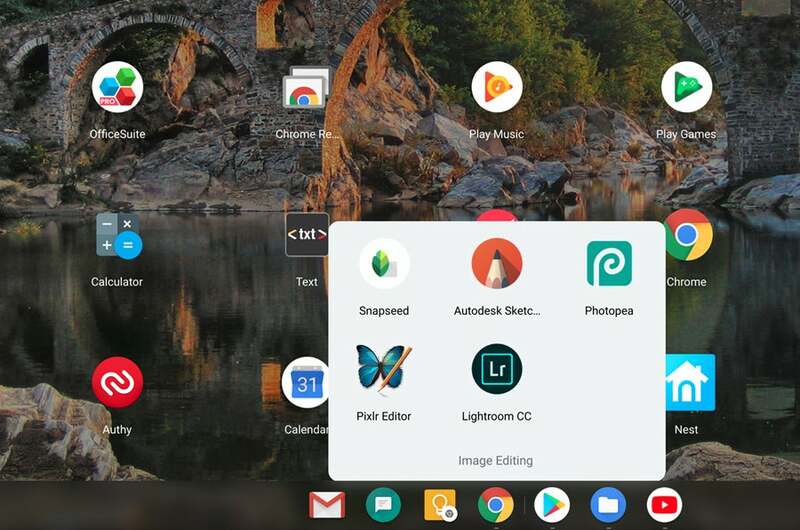 Give your Chromebook's apps some extra organization by creating folders within the Chrome OS launcher. All you've gotta do is click or tap on any app and then drag it on top of another app's icon. You can then click or tap to open the folder and give it a name. And if you ever want to take an app out of a folder, just click or tap the app in question and drag it out. 23. Within a regular browser window, swipe left on the screen — or on your trackpad, using two fingers — to go back one page in your browsing history. Swipe right to go forward. 24. You can also press Alt and the left or right arrow key to accomplish the same thing. 25. In a window with multiple tabs, swipe left or right on your trackpad with three fingers to move among the tabs. 26. Next time you want to open a link as a new tab, save yourself a step and simply click the link with three fingers on your trackpad. It'll automatically open into a new tab in the background — no right-clicking and menu-selecting required. 27. Close a tab quickly by hovering over its title bar and then clicking your Chromebook's trackpad with three fingers. 28. Pull up the browser's main menu in a jiff by hitting Alt-E while in an active window. 29. Need to open up a new browser window from the Chrome OS desktop — or pretty much anywhere else in the operating system? Just hit Ctrl-N.
30. Add any website you visit regularly into your device's shelf for easy on-demand access by opening Chrome's menu (while viewing the site), selecting "More tools," and then selecting "Create shortcut." 31. If you have a shortcut to a website in your Chromebook's shelf and you want it to look more like a regular app — without the browser-oriented elements — right-click or long-press its icon, hover over the arrow next to "New tab," and select "New window" from the panel that appears. 32. If you're really feeling ambitious, you can go a step further and turn any website into an actual native Chrome app — with any icon and color scheme you want — by following the steps outlined on this page. You can make any website look and act like a native Chrome app, as seen here with Slack. 33. Some websites — such as Sling TV — somehow still don't recognize a Chromebook as a valid type of computer and consequently won't let you sign in and use their services. You can get around this by installing the free User-Agent Switcher for Google Chrome extension. Then, just select a different operating system within the extension's menu, and that's it: The silly website will be tricked into thinking you're on a different type of device — and whaddya know, everything will suddenly work fine. 34. Don't make yourself use that oversized on-screen keyboard that comes up by default in a Chromebook's tablet mode. Instead, tap the second icon along the keyboard's top row — the one that looks like a rectangle with a small, dark rectangle inside it. That'll shrink Chrome OS's keyboard down into a far more manageable phone-like keyboard that you can move around (using the "handle" at the keyboard's bottom) and place anywhere you like. 35. If handwriting is more your thing, be it with your finger or a stylus, tap the first icon along the Chrome OS keyboard's top row — the one that looks like a hand-drawn squiggle. That'll give you an open canvas on which you can write anything you want by hand and have it converted into text as you go. 36. 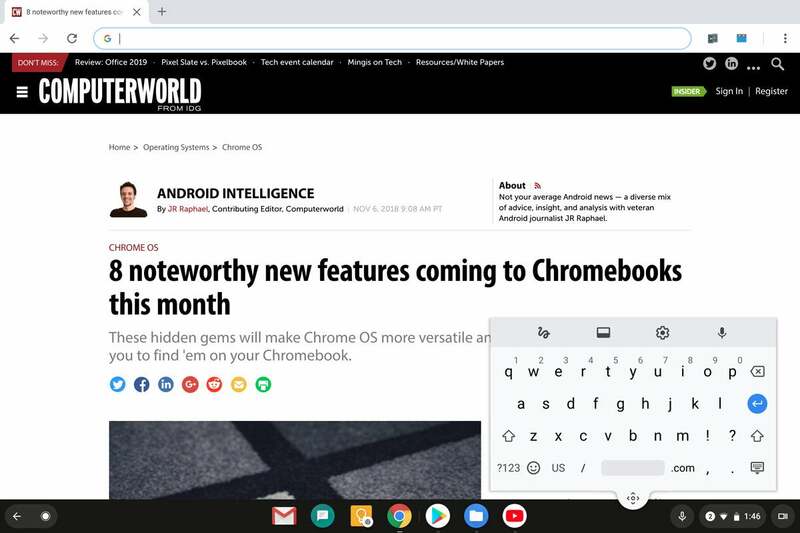 Chrome OS's on-screen keyboard has a built-in microphone icon that makes voice-to-text simple for tablet-style usage, but you can actually tap into the same superb dictation system even when using a Chromebook with a physical keyboard: Open up your Chromebook's settings, scroll all the way down to the bottom, and tap "Advanced." Scroll down more until you see the "Accessibility" header, then tap "Manage accessibility features" beneath it. Next, activate the toggle next to "Enable dictation (speak to type)," beneath the "Keyboard and text input" header. That'll put a small microphone icon in the lower-right corner of your screen, next to the notification panel; you can then tap it anytime to start speaking and have your words transcribed wherever your cursor is active. 37. Find yourself missing the Caps Lock key? Press the Search key and Alt together to activate Caps Lock. When you're ready to STOP SHOUTING, press Search and Alt again to switch back to normal text. 38. Alternatively, if you really miss Caps Lock — and don't mind giving up Chrome OS's Search key to have it — you can remap the Search key so that it functions as a Caps Lock key by opening your Chromebook's settings and selecting "Keyboard" (beneath the "Device" header). 39. Give your Chromebook extra typing smarts by installing Text Blaze, an extension that lets you create complex custom macros for your most commonly used phrases. You could set it up to automatically fill in your mailing address anytime you type "/add" or even to fill in a complicated email template whenever you type something like "*go." The possibilities are practically endless, as is the potential for saving time.